The £1.6bn+ state aid supported Broadband Delivery UK programme has published its final progress update for Q1 2018, which confirms that it has so far helped 4,852,808 extra premises across the United Kingdom to be put within reach of a fixed “superfast broadband” (24Mbps+) network. Currently a little over 95% of premises in the UK are estimated to be within reach of a fixed line superfast broadband network, which is partly thanks to the Government’s BDUK scheme. The next step will be to extend this to 98% by around 2020, while the final 2% is expected to be tackled via a mix of alternative network providers (altnets) and the forthcoming 10Mbps Universal Service Obligation (USO). Most of the BDUK roll-outs have been supported by contracts that harness Openreach’s (BT) ‘up to’ 80Mbps Fibre-to-the-Cabinet (FTTC) and a small bit of their ultrafast Fibre-to-the-Premise (FTTP) technology. More recently we’ve also seen fixed line and wireless altnets like Gigaclear, Call Flow, UKB Networks and Airband win a number of contracts, particularly around remote rural premises where Openreach tends to struggle. We should point out that the Government has made this their final quarterly “premises passed” progress update for the BDUK programme, which is disappointing because related deployments are expected to continue until 2020 (tracking progress will now become harder); albeit at a slower pace due to the completion of the primary Phase 1 + 2 contract phases. We will however be able to include some of the same details when periodically updating on take-up (example). 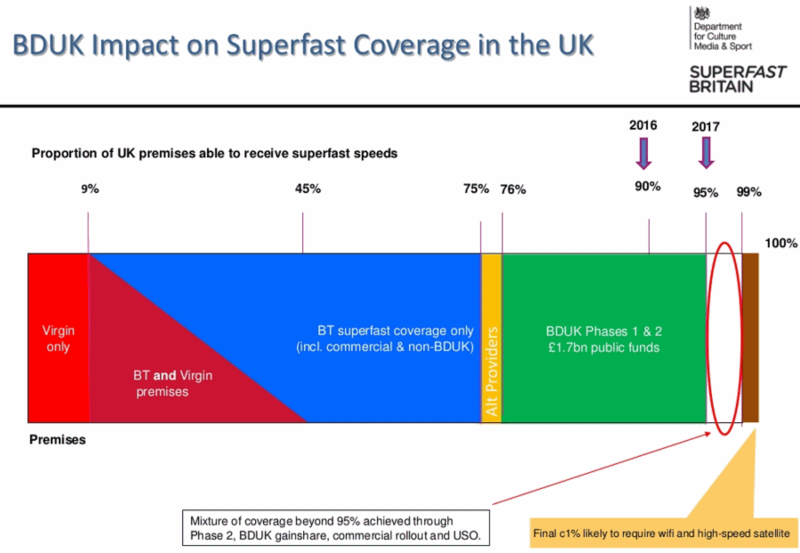 The “premises passed” figure used below only reflects those properties (homes and businesses) able to access “superfast” speeds of 24Mbps+ as a result of BDUK linked investment (i.e. it excludes those that have benefited but which only receive sub-24Mbps speeds). Similarly the data excludes “overspill effects” of BDUK-supported projects on premises which already have superfast broadband. The following table only shows state aid from the Government’s project (BDUK) and does NOT include match-funding from local councils, the EU and other public or even private sources. The headline figures used above are said to be cash based (i.e. when grants are made or budgets transferred). On an accruals basis, which matches costs incurred to the timing of delivery, cumulative BDUK expenditure to the end of December 2017 has been estimated as £637,129,745 and that equates to 7,617 premises covered per £million of BDUK expenditure (expenditure is higher for this because the work has been delivered in advance of payment). The roll-out pace has slowed but that is normal because the programme is currently reaching some of the most challenging rural and tedious sub-urban locations (e.g. Exchange Only Lines), which cost more and deliver fewer premises passed in the same space of time. There’s also a question mark over the impact of clawback (gainshare) on the figures, which sees suppliers like BT return some of the public investment when take-up goes beyond the 20% mark in related areas. So far up to £536m could potentially be returned (here), which can then be reinvested into further broadband improvements. On top of that around £210m from efficiency savings will also be available (here). Most or all of the above funding / reinvestment will be used to help bridge the gap between 95% and 98% coverage by 2020. NOTE 1: Future deployment phases (i.e. those aiming to deliver coverage above 95%) will be adopting the slightly improved 30Mbps+ definition for “superfast broadband“. The EU and Ofcom have been using this definition for many years, although official BDUK contracts were slow to do the same. 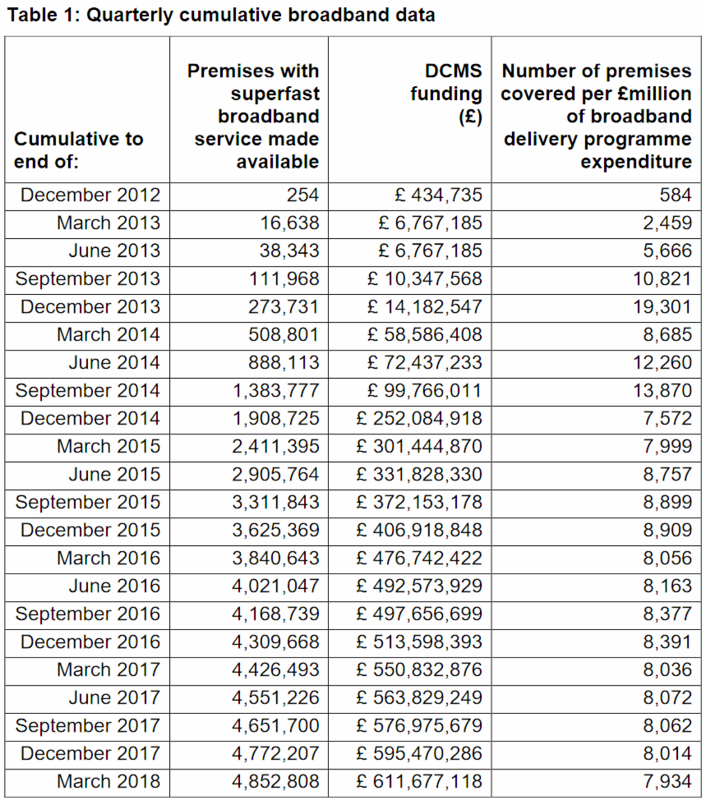 NOTE 2: The above expenditure figures exclude support for Connection Vouchers, the Mobile Infrastructure Project, the Rural Communities Broadband Fund, the Market Test Pilots, DCMS administrative expenditure and the new “Full Fibre” programmes. NOTE 3: As we reported in October 2017 (here), BDUK supported projects have overbuilt some of Virgin Media’s network to the tune of around 1 million premises, although such premises are not eligible for public funding and so haven’t been included into the above total. 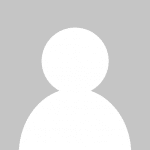 NOTE 4: The commercial market (i.e. purely private investment) has already enabled operators, such as BT and Virgin Media, to extend the reach of superfast broadband to around 76% of UK premises. However the major operators’ tend to view many of those in the final 24% as being “not commercially viable,” hence the reason for BDUK being setup to boost the roll-out via public investment. I met someone today who said that two of her neighbours were unable to order the FTTP service recently installed with BDUK funding because of capacity issues. I wonder how these premises are dealt with under these stats. Are they shown as not passed so there is 100% take up, or are they shown as passed when in reality they are not? What is an FTTP capacity issue? A full aggregation node? No spare connections at the exchange? A full duct? Not enough staff to undertake installation? An ISP who does not sell FTTP? The ISP is BT. Should be nothing to do with excess constructions charges as the premises were “passed” by the BDUK rollout and that has not been given as a reason. At this late stage its hopefully not underprovision based on an underestimate of the take up. Gerarda, I reported a few of these, and the OSS/BSS needed configuring. It is quite challenging in an asbtract sense to associate a connectorised block with a bunch of properties. I assume each area needs to learn the art of this. What about my new build house.2 years old now with no plans to upgrade from a 2mbps connection. The developer blames BT,openreach blame the developer. It’s not hard to connect, they just aren’t doing it. It seems strange they wouldn’t act faster to reach these targets in easy areas like this. There must be hundreds of people on this estate now without fibre. Thanks wainhomes for being too cheap to install anything but outdated copper. The developer is to blame: they took the cheapest option which was requesting a bog standard copper line from Openreach. Why did you buy the house without checking that the broadband was adequate for you? 80,000 properties in the quarter, £35m state aid receipts reported in BT’s accounts, yet their is hundreds of millions to do more work and the Capital Deferral needs a plan. I guess the B-USO will have to be kicked down the road for quite some time if there is no resource or wherewithal to apply these resources. Openreach can’t legally just go ahead and spend that money – you know that right? It is not in their gift to decie what to rollout, they must be contracted to do it. 125us – Of course, but we have not seen a proposal for what are unprecedented circumstances. It is within OR gift to outline what is possible. It would also be good for OR to outline what they would do with the remaining and unreported balances in Local Authority accounts set aside for Broadband. If they do not, they risk losing funding earmarked for rural connectivity.